Therefore, I put together a good mix of updated and new models that are hitting the market in 2018. I also tried to include strollers from different categories like: joggers, full size, sporty all-terrain, reversible seat, convertibles (from single to double), and compact lightweight models. Second year in the row the first place goes to my beloved Nuna Mixx2 because it’s still my favorite stroller in the reversible-seat full-size category. This is a truly amazing stroller that has everything you need. You will love roomy reversible seat with a flat recline suitable from birth, huge basket, huge canopy, easy fold, adjustable leg rest, adjustable handle bar, large foam-filled wheels, flip-flop-friendly brake, all-wheel suspension and easy fold. You can use it with a toddler seat or convert it into a travel system with the Pipa car seat or convert it into a pram by getting a bassinet (sold separately). The Mixx2 is available now and retails for $599 by itself. It comes with rain cover, car seat adapters, and bumper bar. You can also get it as a travel system with Pipa car seat (one of the best on the market) for $1,139. Pros: reversible seat, flat recline suitable from birth, adjustable handle bar, huge basket, huge canopy, flip-flop-friendly brake, all-wheel suspension, bassinet option, travel system option, adjustable leg rest, easy fold. Cons: bulky, works only with Nuna and Moxi-Cosi car seats. The UPPAbaby Vista is one of the best selling strollers in the US. Parents love its high quality and ability to turn from single into a double mode. It comes with a bassinet and features reversible seat, huge canopy, deep recline, XXL basket, large all-terrain wheels and easy fold. For 2018 they increased bassinet size, improved front wheels, added premium real leather handle bar and bumper bar covers to all the colors and of course new color choices. The leather is REACH certified meeting EU requirements for chemical testing. 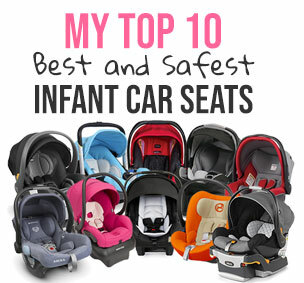 You can easily turn it into a travel system by getting UPPAbaby Mesa infant car seat (one of the best). It can hold two toddler seats, two bassinets, or two infant car seats. You can even add a third child by getting a stroller board called PiggyBack Ride-Along board. You can get it now for around $899 depending on the color. Pros: reversible seat, double mode option, included bassinet, travel system option, all-terrain tires, huge basket, adjustable handle bar, adjustable leg rest, intuitive one-step fold, deep one-hand recline, all-wheel suspension. The UPPAbaby has also recently upgraded its Cruz model which has a lot of functionalities of the Vista, but because of the smaller wheels and narrower frame is lighter and more compact. Just like Vista it features huge canopy, large basket, adjustable leg rest, adjustable handle bar, one-hand lever recline and more. For 2018 they’ve only added real leather handle bar and bumper bar covers to all of their colors. Before it was only on a few selected colors. The leather is REACH certified meeting EU requirements for chemical testing. It can also be transformed into a travel system with my favorite UPPAbaby Mesa car seat or into a pram with an addition of a bassinet (sold separately). It’s available now and can purchased for around $499. Pros: reversible seat, huge canopy, large basket, adjustable leg rest, adjustable handle bar, one-hand lever recline, easy fold, bumper bar, flip-flop-friendly brake, bassinet option, travel system option. Cons: no suspension, bulky fold. Bugaboo rarely adds new models to their collection, so I was very exited to see the new Bugaboo Fox which is a cross between the Buffalo and Cameleon models. BTW, they are discontinuing Buffalo. I think that Fox has the best features of both. It’s still a full size model, but weighs only 22 lbs vs Buffalo that was 27 lbs. That’s very light for an all-terrain reversible-seat stroller. You can use it from birth with an included bassinet or turn it into a travel system (works with most popular car seats). It also has a large basket, large canopy, roomy seat, one-hand 3-position recline, adjustable handle bar, easy fold, standing fold, flip-flop-friendly brake (it was not friendly on Buffalo), and all-wheel suspension (no suspension on Buffalo). The main difference is that you can customize everything on Fox: the canopy, the seat, the frame, and the handle bar. It retails for around $1,199 (depending on the fabrics) and comes with a bassinet and a bumper bar. Pros: reversible seat, large basket, large canopy, roomy seat, one-hand 3-position recline, adjustable handle bar, easy fold, standing fold, flip-flop-friendly brake, all-wheel suspension, included bassinet, travel system option, all-terrain wheels, two-wheel mode, large front wheels, light weight, included bumper bar, included rain cover, stroller board option. Cons: no peekaboo window, bulky fold, no adjustable foot rest, little storage, high price. Bugaboo Cameleon 3 is another parent’s favorite stroller in the luxury category. With a high price tag comes the style, high quality and innovation. This buggy will last you for years and many kids. Some of my favorite features of Cameleon 3 is all-terrain wheels, adjustable suspension, huge basket, huge canopy, reversible seat, and reversible handle bar. The included bassinet is perfect for the newborn and will give your newborn an extra sleeping place at home. All of this comes with a high price tag of $1,219. Ouch! It does include a bassinet, bumper bar, and rain cover. You can also transform it into a travel system with many popular car seats including Peg Perego, Chicco, Britax and Maxi Cosi. Pros: reversible seat, large basket, large canopy, roomy seat, 3-position recline, adjustable handle bar, easy fold, standing fold, flip-flop-friendly brake, all-wheel suspension, included bassinet, travel system option, all-terrain wheels, two-wheel mode, included bumper bar, included rain cover, stroller board option. Cons: two-hand recline, no peekaboo window, bulky fold, no adjustable foot rest, little storage, high price. Bumbleride Indie is one of my favorite all-terrain jogging strollers. This was actually the first strollers I kept after testing a few dozens other models and returning them back. I am happy to report that I’ve used it for many years with my daughter and hope to use it with my future kids. For 2018 it got a few minor updates: The canopy height has been increased so you can fit even taller child. The levers that you pull to fold the stroller are easier to operate. There is an automated lock now that activates once the stroller is folded. There are two new pockets in the back of the seat for extra storage. And of course new color combinations. It also features adjustable leg rest, adjustable handle bar, huge canopy, magnetic peekaboo window closure, large storage basket, large jogging wheels, amazing maneuverability, light weight, compact fold, and eco-friendly fabrics. It’s retailing for around $549. If you don’t care about recent updates, you can grab an older model at a nice discount. Pros: adjustable leg rest, adjustable handle bar, huge canopy, magnetic peekaboo window closure, large storage basket, large jogging wheels, light weight, compact fold, auto lock, eco-friendly fabrics, travel system option. I think it’s safe to say that the Babyzen Yoyo is the MOST popular model among traveling parents with kids. 99% of traveling bloggers that I follow use Yoyo. This lightweight buggy folds into a small package that fits into overhead luggage compartment on a plane and is allowed as a carry-on by most airlines. While weighing only 13 lbs, it is very durable and can handle the bumpiest surfaces. The wheels do look small, but they provide a great maneuverability. It also features roomy seat, large tall canopy, deep recline, good size basket, and all-wheel suspension. The YoYo+ Plus 6+ is sold for around $499 (from 6 months). Or you can also add YoYo+ Plus 0+ attachment for a newborn for around $225. If you travel a lot, I think this is a great investment. Pros: super compact fold, light weight, good canopy, deep recline, good size basket, all-wheel suspension, newborn cocoon option, travel system option, tall handle bar, tall canopy. Cons: no adjustable handle bar, no bumper bar option, small wheels, high price. The GB Pockit has recently rocked the world by featuring the most compact fold EVER, so I couldn’t imagine it getting any better. Well, the Pockit+ Plus 2018 model has a recline, larger canopy, and can take a car seat! That’s right, while weighing only 13 lbs it can be turned into a travel system with an addition of any GB or Cybex car seats. The fold has slightly increased, but is still very compact so you can take it on board on any airline. Now, the wheels are very small so I don’t think it can handle road as well as Yoyo model. It retails for around $229. The original GB Pockit is available now for around $179. Pros: recline, super compact fold, light weight, travel system option, roomy seat. Cons: small wheels, small canopy, small recline, none adjustable handle bar, small basket, no peekaboo window, no flip-flop-friendly brake, lack of available accessories. After seeing the popularity of lightweight models with compact fold the UPPAbaby decided to release its own non-umbrella lightweight stroller called Minu. It’s not as compact as Yoyo+ and GB Pockit, but it still folds into a pretty small package with just one hand. Since this buggy is not out yet, I have limited information on the features, but I can tell you that it will include a roomy seat, large easy-to-access basket, large canopy with pop-out sunvisor and mesh peekaboo window with a magnetic closure, auto lock, standing fold, small storage pocket, all-wheel suspension, flip-flop-friendly brake and a strap recline. The seat can handle a child from 3 months and up to 50 lbs. It weighs only 14.5 lbs and can be easily carried over the shoulder. Despite the light weight it can be converted into a travel system with an addition of the Mesa and Maxi-Cosi car seats or into even a pram with an addition of ‘From Birth Kit’ (sold separately). You can pre-order UPPAbaby Minu for around $399. Pros: roomy seat, light weight, large basket, large canopy, magnetic closure, auto lock, standing fold, one-hand compact fold, small storage pocket, all-wheel suspension, flip-flop-friendly brake, a strap recline, newborn cocoon option, travel system option. The Britax B-Free is a new all-terrain stroller from Britax that combines all the great features from super popular B-Agile and Baby Jogger City Mini GT. It’s like Brtiax have been reading my reviews and making notes because the’ve pretty much covered all of my complaints. LOL. The B-Free has everything you would want in an all-terrain stroller like: roomy seat, huge easy-to-assess basket, huge canopy, adjustable leg rest, adjustable handle bar, high weight limit of 65 lbs, deep recline and a LOT of storage. You can easily fold it with just one-hand in no time! You can turn it into a click-and-go travel system with an addition of Britax car seat. It only comes in black and retails for around $359. The travel system with B-Safe infant car seat is available for around $605. Pros: huge easy-to-assess basket, huge canopy, adjustable leg rest, adjustable handle bar, high weight limit of 65 lbs, deep recline, a lot of storage, one-hand fold, travel system option, included car seat adapters. Cons: no bumper bar option, no flip-flop-friendly brake. The BOB Rambler is a new addition to the BOB family of joggers. A little brother to the Flex model, Ramber is an all-terrain jogger with a lot of the same features as on Flex, but smaller rear wheels. The 12″ air-filled tires together with mountain bike-style suspension system can handle any type of terrain while providing a very smooth ride. Parents will love a roomy seat that can handle a child up to 75 lbs!!! (that’s till college. LOL. ), large UPF 50+ canopy, large easy-to-access basket, deep recline, and easy fold. You can turn it into a travel system by getting an infant car seat. Works with BOB infant car seat or other major brands. This jogger is retailing for around $359. Pros: large canopy, high weight capacity of 75 lbs, one-hand deep recline, large basket, easy fold, adjustable suspension system, adjustable front wheel tracking, run-away strap, one-step brake, large jogging wheels, travel system option. Cons: non-adjustable handle bar, no flip-flop-friendly brake, no automatic lock, bulky fold. Every year Cybex comes our with interesting new models and 2018 haven’t been an exception. The Cybex Eezy S Twist is one of the coolest lightweight strollers this year. The unique feature of the Twist is the seat that revolves around on the frame with just one hand. You don’t even need to remove your child from the seat to reverse it. How cool is that? But that’s not all. This buggy has a lot more things that parents will love like roomy seat, flat recline suitable for a newborn, narrow foot print, one-hand compact fold, standing fold, flip-flop-friendly brake, good size basket, and a good size canopy. You can also pair it with an infant car seat or a cocoon for a newborn. I think that Cybex Eezy S Twist is designed to compete with popular Babyzen Yoyo+ that’s also have a very compact fold. It is available in five colors and retails for around $299. Pros: reversible seat, medium size canopy, good size basket, flip-flop-friendly brake, all-wheel suspension, one-hand fold, standing fold, auto lock, newborn nest option, narrow frame, travel-system option, deep one-hand recline. Cons: small wheels, non-adjustable handle bar, limited car seat options. This is an ultimate running machine! Although BOB haven’t done any updates to their models in 2018, it’s still has the BEST joggers on the market in my opinion. Both models (almost the same) Revolution Pro and Flex feature roomy seat that can handle a child up to 70 lbs (that’s a lot!!! ), huge canopy with large viewing window, large easy to access basket, adjustable padded 5 point harness, easy compact (for a jogger) fold, large air-filled tires that can handle any type of terrain, state-of-the-art adjustable suspension system, adjustable handle bar, plenty of storage pockets, and a hand brake on the Pro model. The Pro model weighs 30 lbs while the Flex model is a little lighter at 28 lbs. Since Revolution Pro and Flex are the BEST joggers on the market right now, they are at the top of my list. You can get it in three different colors with a silver frame for around $499 on Amazon. Pros: high weight capacity, roomy seat, large jogging tires, state-of-the-art adjustable suspension system, adjustable handle bar, adjustable front wheel tracking, plenty of storage pockets, travel system option, large basket, large canopy. Cons: bulky, heavy weight, no adjustable foot rest. Thule is known for its amazing joggers, but this year it have introduced a four-wheel convertible model Sleek. It turns from single into a double mode and can carry two seats, two infant car seats or two bassinets. You can even add a third older child by attaching a stroller board. With 14 different seating arrangements Sleek will grow with your family. Despite having a lightweight frame and weighing only 24 lbs this buggy can handle two children with 48.5 lbs in the main seat and 33 lbs child in the second seat. That’s about average capacity. Many websites for some reason have incorrect info claiming each seat have weight capacity of 75 lbs. Not true. It also features adjustable handle bar, adjustable leg rest, deep recline, flip-flop-friendly brake, large covered basket, large all-terrain wheels, included swing-away bumper bar, and a large canopy with a pop-out sunvisor. Pros: double mode, reversible seat, adjustable handle bar, adjustable leg rest, deep recline, flip-flop-friendly brake, large covered basket, large all-terrain wheels, included swing-away bumper bar, included car seat adapters, large canopy, light weight, all-wheel suspension, travel system option, bassinet option, stroller board option. Cons: bulky fold, high price. The Silver Cross, a British company, has been making strollers for over 140 years. Their well-engineered high-quality prams have been very popular in Europe for a long time and finally made it to US. About time! The Wave is the first model that Silver Cross has introduced to the US market. It’s a convertible luxury stroller that converts from single into a double mode. You can use it for twins or for siblings of different age. It comes with a matching bassinet and the adapters are built into the frame so you can start using the main seat and the bassinet right away without purchasing any additional adapters. It also features large canopy, large basket, adjustable handle bar, roomy reversible seat, one-hand deep recline, flip-flop-friendly brake, all-wheel suspension, and easy fold. It retails for around $1,299 and comes with bunch of accessories. Pros: double mode, large canopy, large basket, adjustable handle bar, reversible seat, one-hand deep recline, flip-flop-friendly brake, all-wheel suspension, easy fold, travel system option, included bassinet, included bumper bar, bassinet mosquito net, mosquito net, rain cover, bassinet rain cover, cup holder, seat liner, car seat adapters, and second seat adapters. Cons: bulky, very heavy, high price. The Cybex Mios is a great addition to the Cybex family. This lightweight reversible-seat stroller is very stylish and practical at the same time. It’s designed for on-the-go parents who don’t like to be weighted down by a bulky travel system, but still want features of a full size model. The one-hand compact fold is perfect for public transit and traveling. The expandable canopy offers plenty of shade on a summer day. It also has adjustable handle bar, adjustable leg rest, flat recline suitable for a newborn. You can also turn it into a travel system with an addition of an infant car seat. The ‘Paradise Birds’ color is absolutely stunning! This baby is not cheap for a lightweight stroller. It retails for around $649. Pros: reversible seat, light weight, adjustable handle bar, adjustable leg rest, flat recline, travel system option, bassinet option, large canopy, one-hand compact fold, auto-lock, standing fold, included swing-away bumper bar, good size basket, all-wheel suspension, flip-flop-friendly brake. Cons: small wheels, high price, limited car seat capability. The Thule Urban Glide 2 2018 is one of the most popular jogging stroller on today’s market. For 2018 it got a new hand brake on the handle bar that you can just twist to stop the stroller. Parents can also enjoy features like roomy seat with deep recline, large covered basket, large canopy, swing-away bumper bar, rear-wheel suspension system, adjustable handle bar and easy fold. You can also turn it into a travel system for a newborn. Works with most popular brands. It weighs 25 lbs and can handle a child up to 75 lbs. It retails for around $479. No accessories are included. The double version is also available for around $679. Pros: roomy seat, deep recline, large covered basket, large canopy, included swing-away bumper bar, rear-wheel suspension system, adjustable handle bar, easy fold, large jogging tires, a lot of pockets, hand brake, auto lock, adjustable tracking, one-hand fold, travel system option. Cons: bulky fold, stiff foot brake, no accessories included. The Joolz Geo2 is a luxury eco-friendly convertible stroller that turns from a single mode into a double. It comes with a matching bassinet so you can use it from birth. It can handle two bassinets, two car seats or two toddler seats. The unique feature of the Geo2 is when you add the second toddler seat it goes in place of the basket. So there will be no storage basket anymore. Another difference is that the second seat is not the same as the main one, it’s more like a lounging seat because the legs of the child will be out. It does have a recline. While I do like the fact that the stroller stays the same length in the double mode, I personally would like to see a full size seat with more features and some storage place. Other features include roomy reversible seat, deep 3-position recline, large canopy with a pop-out sunvisor, adjustable handle-bar, built-in hooks on the handle bar for a diaper bag, all-wheel suspension, large easy-to-asccess basket, easy fold, and great size wheels that can easily handle different terrain. The main seat is positioned pretty high on the frame so you can use it as a high chair when out on the town. I love how stylish and modern it is. The aluminum frame and leather accents make it definitely stand out. This puppy is not cheap. It retails for around $999 and comes with a bassinet and a bumper bar. Pros: double mode, included bassinet, high reversible seat, deep 3-position recline, large canopy, adjustable handle-bar, built-in hooks, all-wheel suspension, large easy-to-access basket, easy fold, all-terrain wheels, travel system option, included bumper bar, auto lock. Cons: bulky fold, no adjustable foot rest, two-hand recline, small second seat, high price, limited accessories included. The Bugaboo Donkey2 is a luxury all-terrain stroller that known for it’s high quality and sleek design. Parents love its unique ability to convert from single into a double side-by-side mode with just a few clicks. With over 16 seat combinations and included bassinet this buggy will accommodate any growing family. You can buy it as a single version and get a second kit later or you can buy it as a double if you are having twins. It can carry two toddler seats, two bassinets, or two infant car seats. You can even add a third child by getting a stroller board. For 2018 it got a few major updates including: puncture-proof foam-filled wheels that can handle any terrain, new all-wheel suspension, anti-shimmy (anti-jam) solution for front wheels, stronger more balanced frame, high weight capacity side basket with a new cover, and more color combinations than ever before. Just like the previous model it features one-hand deep recline, large basket, huge canopy, flip-flop-friendly brake, no re-thread harness, automatic lock, standing fold, and adjustable handle bar. All these luxury features and high quality comes with a high price tag of around $1,299 for a MONO version (single),around $1,649 in DUO version, and around $1,779 for TWIN (free shipping). I know it’s a LOT! You can probably make a down payment on a car instead. LOL. The good news is that all Bugaboo models have been tested for years and have proven it’s outstanding quality over time. So there shouldn’t be any surprises nor problems. Pros: double mode, single mode, reversible seat, included bassinet, included bumper bar, one-hand deep recline, large basket, huge canopy, flip-flop-friendly brake, no re-thread harness, easy fold, automatic lock, standing fold, adjustable handle bar. The City Tour Lux is a super lightweight reversible-stroller stroller that will be a big hit with the parents. I weighs only 19 lbs, but has all the features of a full-size model. You can use it as a travel system with a car seat or even a pram with a folding bassinet. The reversible seat is super roomy and has 140 degrees recline which is suitable from 3 months. I love the huge canopy with a dark mesh peekaboo window with magnetic closure, adjustable leg rest, large basket, auto lock, standing fold, and flip-flop-friendly hand brake. The best feature is how compact the fold is. It’s multi-step, but very compact. Works with most popular car seats and comes with a travel bag. It retails for around $299. Pros: light weight, compact fold, reversible seat, huge canopy, peekaboo window with magnetic closure, adjustable leg rest, large basket, auto lock, standing fold, flip-flop-friendly hand brake, travel system option, bassinet option, stroller board option. Cons: small wheels, non-adjustable handle bar. Of course there are some other interesting models that haven’t made it to my top 20 like Silver Cross Pioneer, Nuna Demi Grow, Cybex Balios S, Jool Hub, UPPAbaby G-Luxe 2018, UPPAbaby G-Lite 2018 and etc. I will keep my eye on them and let you know what I think after testing them. I hope you liked my post and found it useful. If have any questions or need help narrowing down your choices, let me know by using the comment box below and I will do my best to answer it as soon as I can. I am here for you! Do you have any thoughts on the new ERGObAby 180 stroller? I have a Vista from my first and LOVE it but not how huge the footprint is in my car. The Ergo is a little smaller, just wondering thoughts or comparisons of the two….or other options?. Thank you for your review! I am seriously considering the Nuna Mixx 2 as I find it folds amazing, has nice wheel size (decent price for the wheel size), good storage, and fairly light! Just wondering what your thoughts are on gravel roads? I live in the country so a lot of my walking will be on the road, but into the gravel when vehicles pass. Wondering if you had the chance to test it on that? We tested the bumbleride indie in the store but it felt very flimsy for some reason and the Nuna more stable. Thank you for including Indie in your Top 20 for 2018! Have you had the chance to test the Cybex Balios S and/or the Joolz HUB? Both look like good single strollers with compact folds and decent wheels. Hi there :) I’m expecting in July so I have to make my decision on a stroller and car seat. I was pretty set on the vista, but then read this on the mixx2 lol I also saw that new Tavo. How would you rate the Tavo travel system? I am Looking at the bob revolution and the rambler. I will Need a jogging stroller come time when the kids go back to school. I regularly run 8-13miles a few times a week. Thoughts on those two? I have Seen the revolution and the size is like whoa especially pushing something so big for so long. Any input would be great! Hi I am looking at the bob revolution and the bob rambler for a jogging stroller. I will need something once the kids are back in school. I regularly run 8-13miles 2-3x a week. I have Seen the revolution in person and the sheer size scares me to even have to push that while running a long distance. Any tips or input would be great! Hello! I had initially thought I had my heart set on the Nuna Mixx 2 – but then I laid my eyes & hands on the Cybex Priam Platinum with Lux seat & fell in love with it. I read your review on both strollers, I notice the Priam didn’t make it on your this list – could I ask you for your thoughts specifically comparing these 2 strollers, please? Hi Susan, in response to your last comment , I too live in an area with unpaved roads, many hills, and gravel. Do you think uppababy vista is a good choice ? I was wondering if the Nuna Mixx2 frame folds while the car seat adapters are attached. I know I had a Mama’s and Papa’s Armadillo Flip that did NOT fold with the car seat adapters in, and it drove me so crazy that I sold it. Must have for me is a bassinet, easy fold, not heavy, suspension, and non-plastic wheels. Will Nuna MIxx 2 strollers work with Maxi Cosi Pria 85 Max Convertible Car Seat ?